Cancer is a disease arising from a variety of sub-clonal tumor cells dynamically interacting within themselves and the surrounding environment, resulting in heterogeneous cancer phenotypes that are poorly understood. Sub-clonal tumor heterogeneity is a relatively new aspect of cancer, and its understanding is essential for the development of cancer therapeutics. It is shown that different sub-clones have varying impacts on overall tumor growth and their interactions are essential to maintaining the tumor proliferation. To better understand the dynamics of sub-clonal tumor heterogeneity, we developed a computational framework to construct non-spatial, dynamic mathematical models of tumor heterogeneity. Our method uses high-performance computing to automatically infer models from the data, simulate them through time, and evaluate the in silico results in comparison to the results obtained from the experiments at the bench. The best-fitting model can accurately recapitulate tumor volume and clonal frequency data. Importantly, the reverse-engineered model can be used to predict the results of novel experiments, and hence determine the optimal clone or clones to target for intervention to make the tumor collapse. This project will vastly improve the efficacy of cancer therapies with the use of tumor-specific medication. Additionally, the inferred models may be used to accurately predict tumor growth over a period of time based solely off the genetic profile of the specific tumor. For cancer patients, it means saving their lives–in silico testing for treatments using the patient specific inferred model will predict the best possible therapy. What research experiences have you had? The summer after my freshman year, I had the wonderful opportunity to conduct research as an intern at the Jackson Laboratory (JAX) in Bar Harbor, Maine. At JAX, I researched the genetic basis of migraines. After that experience, I spent a while in Dr. Ivan Erill’s lab working under Sefa Kılıç. I collected data using BLAST and CollecTF on bacterial transcription factors. 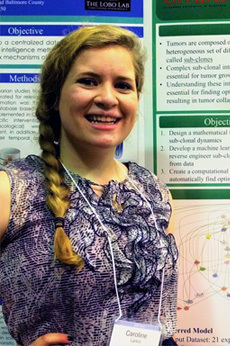 Later I switched to Dr. Daniel Lobo’s lab and began a new, independent research project working on building a computational framework to find mathematical models of tumor sub-clonal dynamics. Having previous experience working in a Bioinformatics lab on campus, I was already aware of the numerous opportunities available in the department, especially since a lot of my friends already work in the labs. After careful thought and research on each lab, Dr. Lobo’s lab seemed like the best fit for me and my research interests. I reached out to him, we had a meeting about my qualifications and potential role and then he offered me a position! Who is your mentor for your research project? How did you arrange to work with this person? The unique part about my research is that it is completely independent. The only person I report to regarding advice and project progress is my principal investigator, Dr. Daniel Lobo, in the Department of Biological Sciences. When I joined the lab, I was given the project of researching cancer mechanisms, a topic that perfectly matches my research interests. Do you get course credit for this work? Paid? How much time do you put into it? During the school year I try to put in about 10-15 hours a week without pay. During the summer I was paid and worked about 30-40 hours per week. What academic background did you have before you started? As a Bioinformatics major, I have had to take a variety of STEM courses as part of my major requirements. As a sophomore entering the Lobo Lab, I had taken chemistry, math and a wide range of computer science and biology courses. By working with Dr. Lobo so closely, I learned everything directly from him. He has spent a great deal of his time sitting down and teaching me about Systems Biology and the specific algorithm that I am working with. Whenever I have a question, I can always walk down the hall and ask him. Additionally, Google has been a fantastic resource when trying to understand the complex mathematical equations I was working with. There are several components of this research project that make it challenging. First of all the coding — I am working with an extremely complex evolutionary algorithm in C++ so just trying to understand what it accomplishes was difficult, let alone editing it for my project! However, with the help of Dr. Lobo I learned enough about the algorithm to work with it and make the necessary changes. Another challenging part about my research is waiting. I know wet lab students are often forced to wait for their experiments to finish but this totally applies to computational biologists too. While my program was running searches, I would have to wait anywhere from hours to days for results to come back. The tight bond between all the members in my lab and even the close relationship with Dr. Lobo. The members of the Lobo Lab have become great friends of mine and we even hang out a lot and talk about our research. Having those kinds of relationships has shown to be extremely beneficial and makes working in the lab a lot more fun. My research in the Lobo Lab has so many connections to courses I have taken in the past. For example, the computational framework I utilize is coded in C++ which is a language that I first learned in Computer Science 202. Additionally, understanding the data I was using required background knowledge of cancer. Luckily throughout all of my biology courses I have learned about cancer and applied this knowledge to my research. Don’t be afraid to ask questions! If you’re confused, it’s totally okay and it’s all part of the process. You’ll often find that your mentor is more than willing and absolutely wants you to succeed. It is much better to ask and learn rather than remain helplessly stuck. My goal is to eventually earn a Ph.D. in Computational Genetics. After that, I hope to one day run a research lab that utilizes computational methods to better understand the genetic basis of many diseases such as Crohn’s Disease. On campus I am heavily involved in Golden Key International Society and I also play soccer for club and intramural. Much of my extracurricular time is spent at my CrossFit box, Blue Crab CrossFit, where I work out almost every day.